The time is fulfilled, and the kingdom of God has come near; repent, and believe the Good news. I love the gospel of Mark. Mark is the first of the four gospels to be written, and the evangelist takes us on along the express route through the high points and low points. In seven short verses, Jesus travels the long day’s journey from Nazareth to the Jordan River, gets baptized, gets named as God’s beloved, is driven out to the desert, encounters Satan and some non-specific angels and wild beasts, and preaches his first sermon, a sermon which in equally spare language announces his mission in the world: The time is fulfilled, and the kingdom of God has come near; repent, and believe the good news. In these seven short verses, we get pairs of seeming opposites that make up the full-ness of the gospel: baptism and the wilderness, angels and wild beasts, repentance and the good news. Both and; both and. Jesus is, as I have said before, a man on a mission. God on a mission. On the move. What drives Jesus? Today, we get one answer: after Jesus’ baptism, the spirit immediately drove him out into the wilderness. Remember Jesus’ baptism, that sublime moment we heard about weeks and weeks ago, and again just now, the spirit descending like a dove, and a voice from heaven saying You are my Son, the Beloved. With you I am well pleased. Before Mark even gives us time to digest what that all means, immediately Jesus is driven by the Spirit into the wilderness. What drives Jesus? It is the Spirit that drives Jesus. Gee, thanks, Spirit. Thanks a lot. What happens in the wilderness? In Mark’s gospel, much is left to our imagination. We know nothing about how Jesus was tempted or with what. 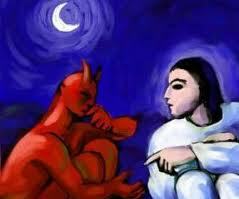 In the parallel temptation stories in Matthew and Luke, the devil tempts Jesus with power, property, and prestige. If Jesus were sent out into the desert today, what would Satan say to him? Dude, there’s a whole lot of hungry people in the world. If you swear allegiance to me, I’ll give you the keys to the Fred Meyer warehouse in Clackamas. I’ll teach you to grow pizza on trees. Good pizza. Even some gluten-free, vegan pizza. I’ll make you Chair of the Federal Reserve. You want to impress people? Follow me and I’ll show you impressive. In the first centuries of Christianity, the desert fathers would go out into the desert to conquer demons, sort of like a medieval knight going on a quest to slay a dragon. They failed to see that the devil is in the wilderness of our own hearts, and we need not go out into the desert to search for him. The temptations to power, property, and prestige are often inside us: the temptation to be someone other than who we are and whose we are. This first-Sunday-in-Lent “temptation gospel” is not about the specific form that the temptation takes, but the pattern: God announces that Jesus is his beloved, his chosen, and then drives him out into the wilderness. We have all had our own encounters with the evil one; I wonder how often these encounters happen at times when we have just had our own experience of the Holy, of being claimed as God’s beloved. Often we are tempted, pulled away from our sense of self, our purpose, just after we have been called to something good, discovered a new passion, or dedicated ourselves in some new and life-giving way. We fall in love, we get a great job, we find something we’ve always wanted to do, we move into our dream house, we find a church we love, and a voice says no, you’re not good enough. You’re too fat, too short, too tall, not strong enough. You’ve never been able to stay sober. That’ll never work. You’re not a good parent. You don’t belong there. It’ll never last. The old good angel/bad angel on the shoulder routine is every real for most of us. I can do this. No, I can’t. Yes, I can. No, I can’t. We would do well to see our desert time as part of our own mission—part of how we get formed as little Christs, to continue Jesus’ ministry of preaching, teaching, and healing in the world. The Spirit drives Jesus into the wilderness, and is with him and in him when he comes out of the wilderness to proclaim the Kingdom of God. Remember what he says after his time in the desert: The kingdom of God has come near; repent, and believe the good news. The Kingdom of God is almost here. To enter the Kingdom we need to repent—turn around—and believe, trust the Good News of God’s healing, reconciling, accompanying love. In the poem, “East Coker,” T.S. Eliot writes: In order to possess what you do not possess, you must go by way of dispossession. 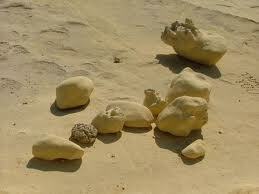 What is your desert? How will it be for you a way of dispossession, of emptying yourself of your own agenda, those things you think you know or expect about yourself and the world around you? What wonderful proclamation will possess you on the other side of the desert? Barbara Brecht, St. David’s vestry member and William Temple House board member preached this fine sermon on Epiphany VI, February 12. What is our mission? Jesus message is a message on a mission, a message of liberty and abundant life, good news of healing and hope. How do we proclaim our message of liberty and abundant life? For what good news are we willing to be all things to all people, to get up and serve when we’d rather be on the couch? When are we willing to give our all, because we know God is working through us? Well, No easy answers to any of those questions. But wonderful questions to help stir our curiosity about the unseen, and sometimes unrecognized opportunities, that really do exist around us if we are willing to see. Today’s Gospel is very familiar to us. A leper is in need of healing and takes the risk of telling Jesus about it. 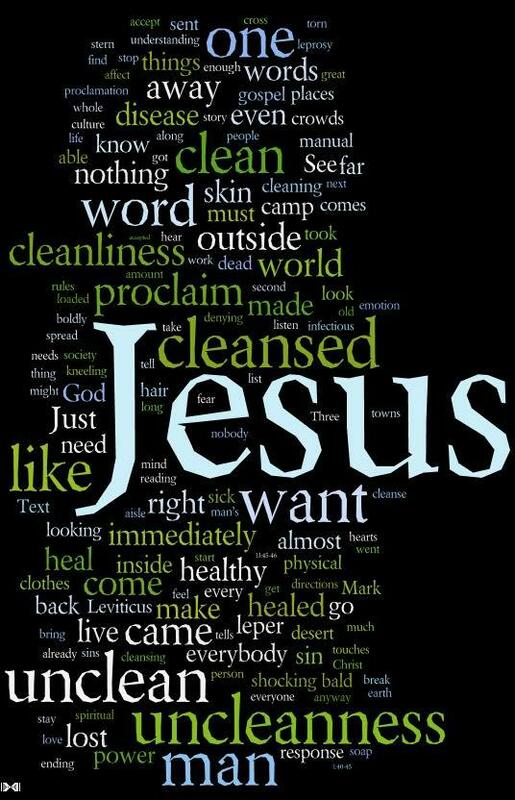 The leper then states “If you choose, you can make me clean.” And Jesus response is pretty pure Jesus: an immediate sense of compassion, a desire to help and capacity to answer the request in a positive manner on the spot. As I sat with this passage, thinking about what it may be calling me to be or do now, I was strongly reminded of a past experience that has been very formative in my life. And how it has contributed to my understanding about how, as a follower of Jesus, “mission” emerges or is discovered. I dropped out of college after my second year and moved from the Midwest to Boulder, Co., one of the major destinations in the early 1970’s for young adults on their quest for what life was all about. The allure of the Rockies was irresistible. My dormant Christian faith became activated at that time and I found myself living with a group of women about the same age, some in college, some working, some pondering and all of us invested in following Jesus and allowing the Holy Spirit to guide and lead us. We were very naïve, but also truly engaged. Word was out that Christians lived in our house and folks came to hang out, crash for several nights, use our phone for long distance calls, have a meal, etc. It fit what we thought was our mission well. Then, one day we had yet another knock at the door. The woman standing there was very tall, very slender, with long black, unkempt hair and had a blanket wrapped around her. Her name was Beverly. She swayed back and forth and then stated, “I want to be baptized. Will you help me?” We were somewhat taken aback and I know I was a bit anxious with her presentation. There was a moment of hesitation, but then we invited her in. In a halting manner she began to tell her story. She had suffered from mental illness for years and did not want to have to be hospitalized any more, if possible. She had a working relationship with a psychiatrist, religiously took her medication and described what situations could lead to her having psychotic symptoms. Beverly felt if she lived with people who would value her and help her if and when her psychotic symptoms emerged, she would be able to move toward longer term stability and healing. Beverly also had become a Christian and, having always felt unclean and like an outcast, she longed to belong somewhere and wanted to be baptized. One person in the house, who is still one of my heroes, immediately embraced her and said we could all probably figure out how this could work. And it did over a three year period. It was extremely complicated at times, fun at times, moving at times and frustrating at times. Beverly did have several psychotic episodes which lasted about five days each time and required 7/24 care. None of us had the training at the time for this sort of work, but we worked with her psychiatrist and were able to keep her safe in our community until the medication adjustments kicked in and she was able to function. Beverly did get better over time. She procured a job. She was a very talented artist who later illustrated two children’s books which were published. She became such a source of wisdom in the house and helped us all to see the world in some wider ways than most of us had experienced. She truly wanted to follow Jesus and found some of the most creative and kind of quirky ways to allow his presence to be known. It was a privilege to have lived with her. She also allowed the community to discover how important connection was for so many disconnected folks. We began to have more folks show up who needed a place to be seen, to connect and to be valued. Soon we needed a larger house for people who were coming, and we found one. We also were discovered by a whole group of older women (at least old to me at the time, in their fifties) who had long been marginalized due to mental health issues and some came to live in the community. It was extraordinary to see what it meant to them to have a place to be, to be seen, to be valued, and to have their contributions recognized and honored. It was an amazing place to be. And, although it has moved, it still is in existence as one of my heroes is still inviting folks who need a place to be to join this community. I look back at that time now with great gratitude. I am currently reading a book wonderfully titled “The Gifts of Imperfection”. I can relate. It endorses that we are more able to live in a more wholehearted, congruent manner when we embrace our imperfections. As we acknowledge our imperfections and practice courage, compassion and connection, we are more able to be open to many possibilities in regard to mission. Discovering mission is so much about the willingness to stay curious, engaged, and willing to consider possibilities with a bias toward taking action. And there is action in our diocese which we celebrate today. Our Bishop has declared today “William Temple House Day in the Diocese.” I serve as a Board member and have seen the excellent services being provided through the House. You have the brochure in your bulletins which gives information about the services offered. I chose to become involved as William Temple House is one of the last, if not the last, agencies in town that offers free counseling to those in need. Father Abbot, the founder of WTH, recognized the need for the working poor to have access to counseling services as they fell between the cracks of coverage: too poor to be able to afford health insurance, and too high of income to be eligible for Medicaid. Dr. Susan Bettis heads the counseling services and is recognized throughout the professional community as providing outstanding supervision and oversight to the interns who work there. I so appreciate her dedication for over the past 15 years in making these services increasingly professional and useful to the community. As you can see from the brochure, the House also provides food and clothing to our friends in the community as well as some financial aid for very specific needs. WTH takes no government monies and is completely funded from donations as well as proceeds from the WTH Thrift Store. And if you have never shopped there, consider it. It will be worth your while. You also see the many opportunities in which we can choose to participate in this mission by “paying it forward” as a volunteer. And volunteers are always needed and greatly appreciated. It is worth considering from a perspective of curiosity and a bias to act. At St. David’s we also support WTH every week by giving the loose change that we receive in the offering plate to the House. (Baggie) It is a great idea to emulate some of our parishoners who frequently drop a baggie full of coins, like this, in the plate. We can all be grateful for the work of WTH. As we continue to consider mission here at St. David’s, each of us can enlarge our capacity to practice courage, compassion and connection. Paul’s admonition in today’s reading encourages practice, practice, practice as we further develop skills in ministry. Through the hot meals program, Rahab’s Sister, UpStart PDX, Monday night Food not bombs, our community partners, and hopefully on and on, mission can be seen, embraced and enlarged. New opportunities may be seen through “Spirit Spotting”, a chance for all of us to intermittently meet together and consider and share where we think God’s spirit may specifically be moving in and through our congregation. 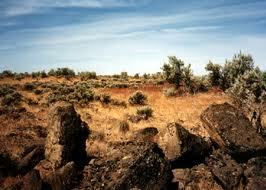 For example, This past week several of us noted an article in the editorial section of the Oregonian. It discussed community partnerships between “JOIN”, an organization that assists homeless families in staying in a home once one is found, and religious congregations. Through financial, social and other supports, this appears to be an opportunity for some congregations, perhaps ours?, to be part of a larger mission in supporting our community and saying “yes” to Jesus’ call to be attentive to those with little voice or resource. It is just one such possibility. What is our mission? It is manifold. It is not a demand to get the right mission, or the only mission or the most hip new mission or, etc. It is the joy of open curiosity coupled with courage, compassion and connection that allow us to joyfully consider and act. We are in a partnership with Jesus and hopefully we are developing his likely response to most requests: Yes, I am willing. Holy, living One, give us the liberty of that abundant life which you have made known to us in your Son, Jesus. What do you hear? This is how I ended last week’s sermon: can we hear past the familiar voices of authority and hear Jesus’ new teaching? What do you hear? What I hear this morning is a phrase from today’s collect; the one that we don’t have in our bulletins but I hope you’ll keep it in your hearts: give us the liberty of that abundant life which you have made known to us in Jesus. We had a great discussion during last Wednesday’s Following the Way class on the subject of sin. Our conversation drove us to the catechism in the back of the prayer book, and we found in the section on sin several references to freedom and liberty. The catechism defines sin as choosing our own will instead of God’s will, and thus distorting all of our relationships, including our relationship with God. How does sin have power over us? the catechism asks. Sin has power over us because we lose our liberty when our relationship with God is distorted. What is redemption? the catechism asks. Redemption is the act of God which sets us free from the power of evil, sin, and death. I promise this is not a sermon about sin. The liberty of that abundant life for which we pray is partly reflected in our faithful response to redemption. When we are no longer distracted by our own will and our own agenda, and instead realize we are living in a state of grace and abundance, we are free. What’s important about what Paul says is that he has become all things to all people for the sake of the gospel. Paul is willing to be a religious pluralist for the sake of the gospel. To faithful Jews, he will remind them that he, too, is a good Jew. To gentiles, he says that he, too, is outside the law, like them. To the Corinthians with their food sacrificed to idols and to the Athenians with their statue of an unknown God, Paul finds a way to communicate the Good News. This is how he understands the grace that has been shown him, that he can function in a whole lot of different religious milieu, because for him, all of these different religions point to the great freedom that is the Good News. The second example of someone’s response to the good news is Simon’s mother-in-law. 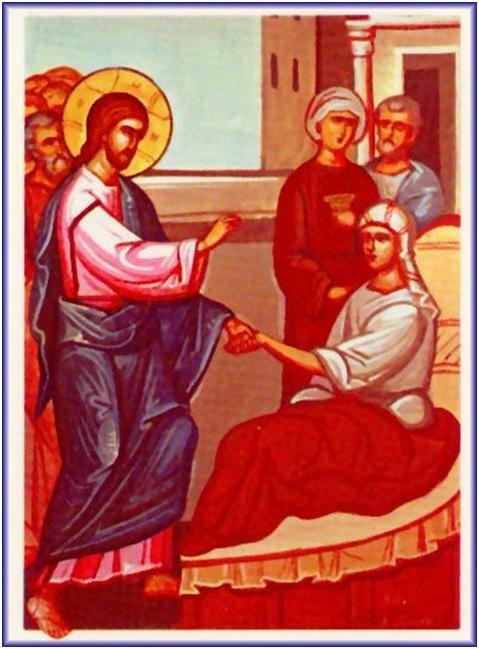 When the fever left her, she began to serve the disciples. I know she always cracks some of us up. Would it kill her to stay in bed for a day or two while she recovers from the flu? Apparently not in Capernaum in the first century. But what if she gets up to serve them not because that’s what was expected of the lady of the house in those days, but because her encounter with Jesus made it easy for her to get up and do what needed to be done as an act of thanks-giving and freedom? Many of you serve this household in that same spirit, and you’re a walking witness to the Good News. The last example I want to share this morning is someone I encountered the other day, at New Seasons. I went to their “Wok Bar” for lunch—something I never do—and the seating area was very crowded. There was one guy getting ready to go, so I hovered around his table as unobtrusively as I could, but close enough to snag the table when he was about to go. He picked up his trash and put it in the nearby can and then came back to wipe off the table, very thoroughly. I mean, very thoroughly. I’m standing there with my tray and I’m thinking: Oh, he’s got issues…. I moved in as soon as he picked up his coat and hat off the chair. We greeted each other with a smile and he asked: “Are you a nun?” No, I said. I’m a priest. Wow. It may not have been true that no one else would’ve cleaned up after him in that setting, but it was definitely true that no one did such a good job. I loved the way he connected a sense of mission, of God’s work, with that simple, mundane task. And he did it with such a sense of freedom, and abundance. What is our mission? For what Good News are we willing to be all things to all people, to get up and serve when we’d rather be on the couch? When are we willing to give our all, because we know God is working through us? Jesus’ message is a message on a mission, a message of liberty and abundant life, good news of healing and hope. How do we proclaim our message of liberty and abundant life?